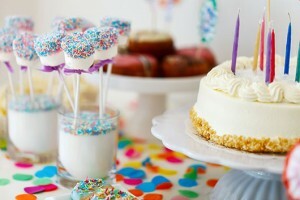 Planning a party can be a lot of fun, but if you’re not careful, the costs can quickly build up. By the time you’ve paid for a venue, drinks, decorations, and entertainment, your “fun” party can suddenly seem like it’s not all it was cracked up to be. One way to save on your party costs is to incorporate DIY decorations, which are not only much cheaper than store bought ones, but are also unique, look fantastic, and show off your creative side. Find a word or image that sums up your party and print it on a piece of paper that’s no bigger than 3.5 x 3.5 inches. 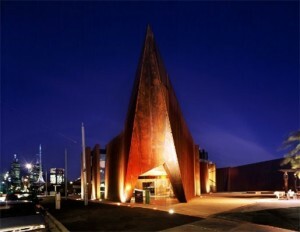 Placing it on a sturdy surface, position a projector on top of the image to project it against a wall. 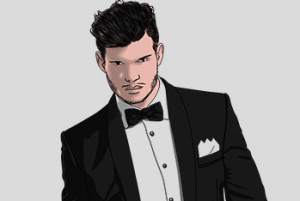 Tape a large poster board where the image lies, and trace the outline with a pencil. 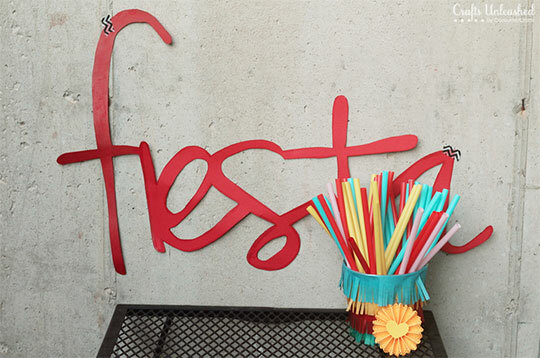 Cut around the pencil lines, and then tape to the wall for your party guests to see and admire. Upcycle your Christmas lights and create strings of colourful lanterns by slipping blowup origami boxes over each individual bulb. The boxes slide on easy and stay firm, but can easily be removed ready for when Christmas rolls around again. You can learn how to make a blow-up origami box here. Mason jars are commonly used at parties as decor, but why not put a twist to them by spray painting them to match your colour scheme? Silver and gold painted jars look fantastic and can be used to hold some fresh flowers. You could also use mason jars as lanterns. All you need is some mason jars in varying sizes and some tealights and voila – one of the easiest yet most effective DIY decorations. Tissue paper pom poms are some of the most common DIY decorations seen at parties, and when you consider the versatility and colour they provide, it’s easy to see why. Watch this YouTube video to learn how to make them. Raid the recycling bin for soup, tomato, and bean cans and using something sharp, poke a pattern into the sides. (To prevent denting, fill the cans with water and freeze them first.) 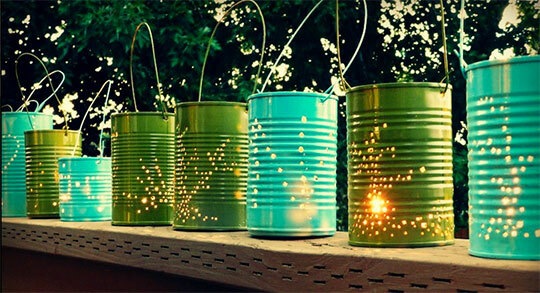 Create a handle using bailing wire, spray paint if required, and then fill each can with a tealight come party night. Add some glamour to ordinary, plain glasses and decorate using spray paint, sticky dots, and glitter. If using glitter, be sure to seal it with a couple of coats of gloss, and the glasses can be used time and time again. 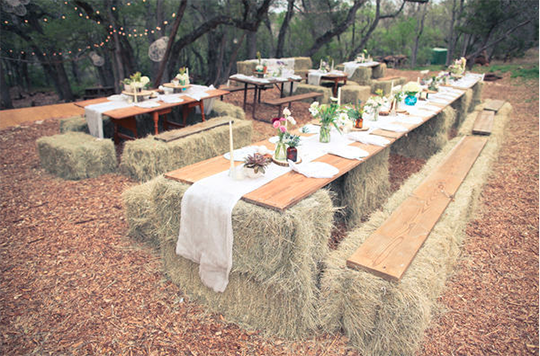 Hay bales are inexpensive, give off a great rustic feel, and also provide extra seating for your guests. Planning on throwing an outdoor lunch party? Why not skip the table and chairs altogether and opt for country-style dining? Any child would love confetti filled balloons at their birthday party, and any parent would love how easy they are to make. Simply take a selection of clear or white balloons, stuff them with confetti, and then fill with helium. Tie a ribbon on the end and you’re done! Quirky yet beautifully delicate, old light bulbs make for great vases once the filaments have been removed. Simply poke two holes through the metal part to attach a wire hanger and then fill with some water and flowers. Hang a makeshift clothes line and provide enough pegs for every person. 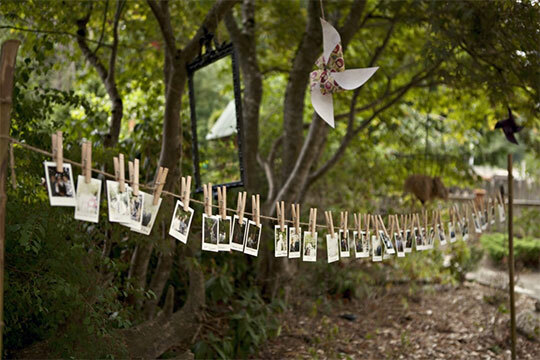 Using a Polaroid camera, ask your guests to take a snap and hang it for the party to see. Not only does it make a great decoration, you’re also awarded a wonderful keepsake. Upcycle an old soup can and glue crayons around the side for quirky utensil holders at your child’s birthday. Alternatively, you could fill them with flowers or use them to hide the weights on your helium balloons. Create your own glow in the dark balloons and illuminate your party with a bunch of balloons and some LED lights. Simply turn your lights on the day of your party, pop them inside a range of balloons, and then fill with helium. 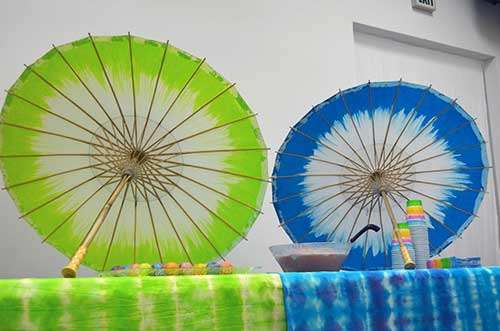 Tie dye works well on paper, and the rice paper texture of these parasols give a great effect. Colours are vibrant yet subtle, and whether set up to provide shade or hung from the trees, they’re a decoration that will get your guests talking. Paper cups can be relatively inexpensive, and you can usually find some to match your theme. Simply punch a hole in the bottom of them and place over a string of lights, and you’ve got some personalised lights. For a rustic theme, you can’t go past a rusty wheelbarrow that’s loaded with ice and refreshments. You could even spray paint your wheelbarrow to match your colour theme or fill it with little gifts for your guests to take home. For a pop of colour in the centre of your tables, turn to spray painting old wine bottles and filling them with gerberas and baby’s breath flowers. Wine bottles can also be filled with fairy lights, or make great candle holders as part of a DIY candelabra.